John-Paul Cleary lives in a small town called Stonehaven in the North-East of Scotland with his girlfriend and their three-year-old daughter. Interested in most fiction genres but specialising in science fiction, his biggest influence is the Culture series by fellow Scot Iain M Banks. John-Paul published his first book Convergent Space, a dramatic galaxy-spanning space opera, in October 2011. 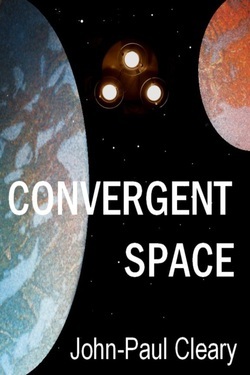 Convergent Space is the first book in the series, with the second book due out in 2012. Earth is a faded galactic power in a violent galaxy. Blamed for an event 200 years earlier that destroyed thousands of worlds and turned the galaxy upside-down, Earth has been shunned by galactic society ever since. Rone Tintet is one of Earth’s immense army of space-faring investigators. She discovers an artefact that may reveal what really happened 200 years ago and resurrect Earth’s fortunes. She embarks on a journey that takes her half-way across the galaxy but will there be anything left when she returns?